We have already covered a Google search app which can be used search queries without leaving main mobile interface .Google upgraded this app and integrated all other Google mobile applications like search ,Gmail ,Orkut ,Youtube ,maps into a single platform better known as Google mobile app . Google mobile application is available for Nokia Symbain ,Windows mobile ,SonyEricsson ,iPhone ,Android and BlackBerry phones .Download Google mobile application. 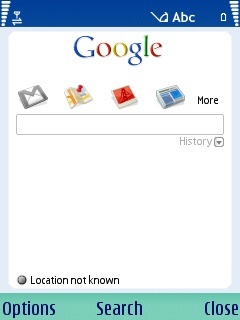 Easily access Google mobile from phone interface . Finds location using Google latitude and maps . Saves search history and provides search suggestion . Can configure Google search application to a particular locality to get personalized results . Download Google mobile application .